An innovation that allows you to move your drapery effortlessly across the rod. The secret is in the Carriers. Use this innovative rod from ELEMENTS by Unique Fine Fabrics. 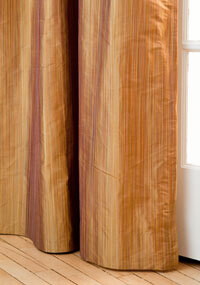 It works perfectly with faAB ready-made drapes. All the faAB panels come complete with a package of pin hooks (except Grommet and Rod Pocket) and instructions on how to install the pin hooks are included with your faAB drapery or online here. For your Installation you will require: Channel Rod(s), Brackets, Finials, Carriers, End Stops, and if joining two rods together, a Channel Joiner and Seam Cover. Channel Rods are available in 4' (122 cm), 6' (183 cm), 8' (244 cm) lengths. They have a diameter of 1-3/8" (3.5 cm) and are available in four finishes. Calculate the length of the rod you require, the three standard lengths can be cut to fit using a hack saw. You can customize your rod with a hidden Channel Joiner and cover the join line with a Seam Cover, also available in four finishes. 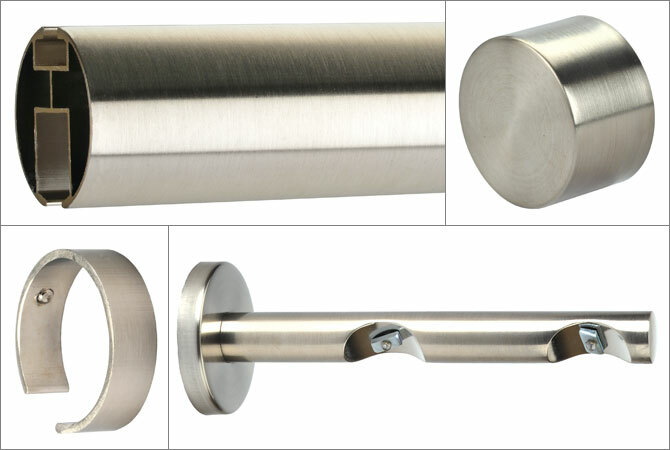 To view the complete list of components in the ELEMENTS line visit our Drapery Hardware page. When installed properly the drapery panels hang on the carriers positioned inside the bottom edge of the Decorative Channel Rod. Start by determining at what height you would like your drapery rod to hang. Then simply subtract 1-1/2" (4 cm). Then order your drapery panels at that length. Example: Rod installed on the wall 102" (260 cm) from the floor. Take 1-1/2" (4 cm) off and order panels that are 100-1/2" (256 cm) in length. For installing channel drapery rod right at the ceiling. Measure your wall height, then simply subtract the 1-1/2" (4 cm). Order your drapery panels at that length. Example: Rod installed at 96" (244 cm) minus 1-1/2" (4 cm) order panels at 94-1/2" (240 cm) in length. The panels will lightly rest on the floor. Note: Finials cannot be used with the ceiling mounted rod. Install End Caps for a finished look. 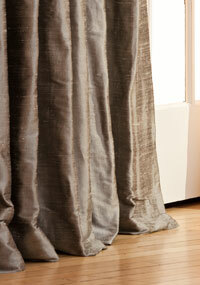 For a designer look, add 2" (5 cm) to 5" (12.5 cm) so the drapes kneel casually on the floor. Don’t want the panels to touch the floor, make the panels shorter. It is your choice. The correct quantity of Carriers (plus two End Stops) are provided based on the number of panels ordered, their widths and the Heading styles chosen. You simply slide the Carriers and End Stop (it holds your drapery in place with a nut and bolt, inserted before the last carrier) onto the channel. A special feature of the Channel Rod is your ability to have your panels meet in the centre of the pole, but not overlap, or to draw across the whole width of the rod from either left or right—perfect for a Patio Door. 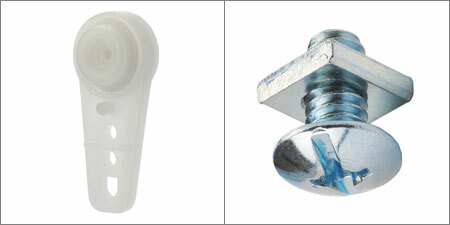 For installation of the pin hooks, use the tabs on the back of the panel as your guide. This will ensure even spacing across the heading. To ensure your Carriers are not visible, position the top edge of the pin hook 1/2" (1.25 cm) from the top edge of the panel. When installing panels on the Carriers use the lowest hole position available. 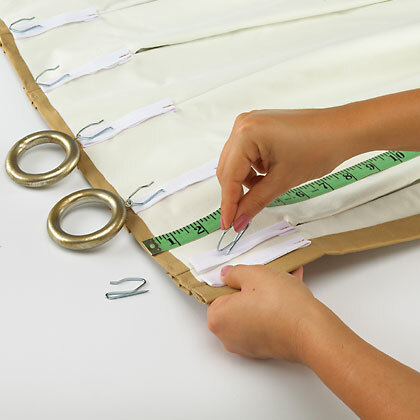 For stability, push the pin hook through both layers of the tab and into the lining then push the tip of the pin hook all the way through the layers of fabric. Once the Channel Rod is properly installed, and all the Carriers are in place, hang the draperies on the Carriers using the pin hooks positioned on the back of the drapery panels. Decorative Finals have been specifically designed for use on the Channel Rod and are available in eight styles and four finishes. Finials complete the look. The drapery Fling works to move your drapery gently across the rod. It is attached to the top edge of the panel with a hook. This allows you to slide the draperies across the rod without pulling on the panel or the drapery can move easily by manually pulling the drapery across the Channel Rod. Available in four finishes.